Are You Suffering From Sacroiliac Joint Pain? Many people have never heard of the sacroiliac (SI) joints and have no idea of where they are or what their function is within the body. But those who suffer from sacroiliac joint pain are all too familiar with the joints themselves and the pain caused when something goes wrong with them. “Sacro” sounds a little like “sacrum”, which is a triangular-shaped bone in the lower part of the spine, centrally located just below the lumbar spine. The sacrum, unlike most of the spine, is not mobile. It’s made up of five vertebrae that are fused together. “Iliac”, the second part of the word, refers to the two large bones (ileum) that make up the pelvis. The sacroiliac joints, or SI, are what connect the spine to the pelvis. The sacrum and the illiac bones are held together by a group of strong ligaments. There is very little motion at these joints. Most of the motion in the area around the pelvis is either facilitated by the hips or the lumbar spine. The joints act primarily as shock absorbing structures. There are numerous terms for pain in the SI joints, including SI joint dysfunction, SI joint syndrome, SI joint strain or inflammation. All refer to a condition that causes pain in the SI joints stemming from different causes. As with most joints in the body, the SI joints are covered by a protective layer of cartilage. When this cartilage is either damaged or worn away, the bones begin to rub against each other, eventually causing degenerative arthritis (sometimes known as “osteoarthritis”) to develop. Aside from aging, one common cause of SI dysfunction is pregnancy. Hormones released during pregnancy allow the ligaments to relax, allowing for more movement in preparation for childbirth. The increased movement in the joints can and often does cause increased stresses and abnormal wear. In fact, any condition that changes the normal walking pattern puts stress on the SI joints that can lead to pain. This might be one leg that’s longer than the other, or pain in another joint such as the hip, knee or ankle, that causes a change in the way a person walks. Too much movement typically causes pain in the lower back or hip area which sometimes radiates in the groin area. Too little movement usually results in pain on one side of the lower back or buttocks which sometimes radiates down the leg (similar to the pain of sciatica). As mentioned, a problem with the SI joints causes symptoms ranging from lower back, hips, buttocks, groin and legs. The pain is usually worse with prolonged sitting, rolling in bed, getting in and out of bed, getting in and out of the car. Sometimes, there may also be stiffness in the SI joints and a burning sensation in the pelvis. The first step in diagnosing a problem with the SI joints, is gathering a medical history and performing a physical exam. The physical therapist will ask questions to try to ascertain whether there are any underlying disorders that could be causing a patient’s pain. Because there are other conditions that can produce similar symptoms, it’s basically a process of elimination that helps narrow down the diagnosis. Certain “signs” can also help the doctor differentiate SI pain from pain coming from other sources such as the lumbar spine or the hips. Various tests can be performed during the physical that can help pinpoint or isolate the source of the pain. 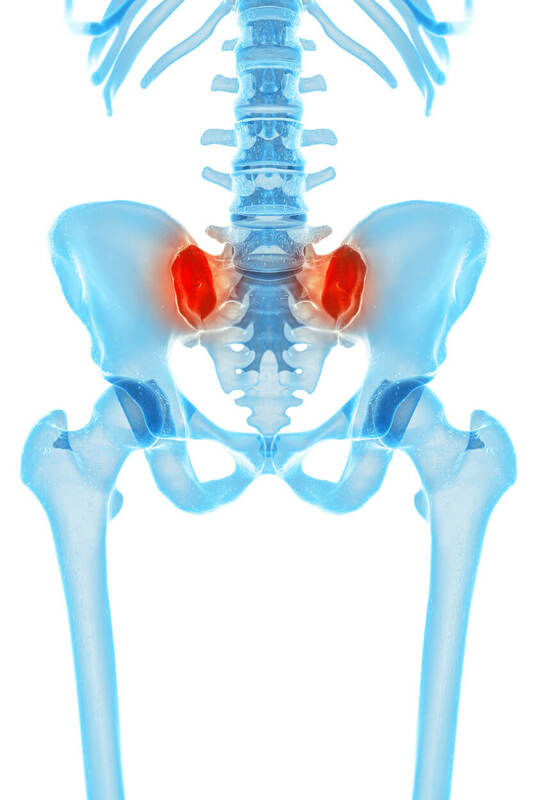 Putting the hips and legs in certain positions and then applying pressure can move or apply pressure to the SI joints to determine if they’re what’s causing the pain. In other words, the physical therapist actually tries to “provoke” pain in the SI joints. Physical therapy is often very useful in treating SI joint pain. A physical therapist will prescribe exercises and stretches that can often go a long way toward providing significant pain relief. What’s even more helpful is a specialty field in physical therapy called manual therapy. It’s form of therapy where the physical therapist uses skilled techniques learned through additional training that helps move the pelvis and the spine, and optimize the condition of the muscles surrounding the sacroiliac joints. But it all starts with a thorough and comprehensive physical examination. A good evaluation lays the foundation for successful treatment.